Championship leaders Wolves came from behind to draw with 10-man Preston North End at Deepdale. Shortly after striking the post, Alan Browne put Preston ahead with a header from a Callum Robinson corner. But North End had John Welsh sent off for a second bookable offence, leaving the hosts with 10 men for 31 minutes. 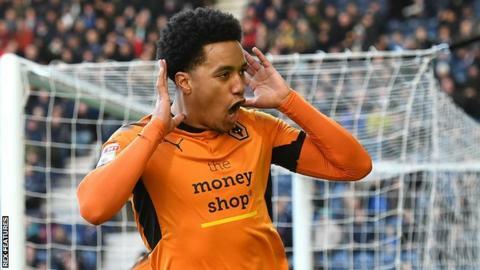 Wolves equalised quickly, Ivan Cavaleiro setting up Helder Costa to slot home, but the visitors were denied a fourth successive victory. Substitute Benik Afobe had the best opportunity for a Wolves winner, but he was denied by Preston goalkeeper Declan Rudd. Wanderers' lead at the top of the Championship was reduced to 11 points, while play-off chasers Preston have lost only once in 16 league matches and are two points off the top six. The reverse fixture in October, which Wolves won 3-2, sparked into life after a quiet first 45 minutes and the game at Deepdale followed a similar pattern. Browne, who was sent off in the match at Molineux, had a more positive impact on his home ground to nod in the opener. But the game hinged on Welsh's red card, shown following fouls on Diogo Jota and Cavaleiro either side of the interval, and Wolves took control from then on. "In the first half we limited Wolves to not many chances, but I thought we had one ingredient missing in the first half which was a bit of belief that we could beat them. "That was the basis of my half-time team talk. We started the second half on the front foot, we got our goal. "What would have been really good would have been to keep 11 men on the pitch and see how the game transpired. At that stage I was really confident that we would have gone on to win the game." "Everybody thought that we were closer to winning the game, but playing against one man less requires a different approach. I think we created enough chances to win it, but we have to have a different approach and it's something we have to look at. "In the same way, we have to look at set-pieces because we were in control of the game and we concede from a set-piece. "I am not happy with the result because we prepare every game to win. We need to look at what happened today and get better." Match ends, Preston North End 1, Wolverhampton Wanderers 1. Second Half ends, Preston North End 1, Wolverhampton Wanderers 1. Attempt missed. Rúben Neves (Wolverhampton Wanderers) right footed shot from outside the box misses to the left. Substitution, Wolverhampton Wanderers. Léo Bonatini replaces Ivan Cavaleiro. Substitution, Preston North End. Josh Harrop replaces Daniel Johnson. Substitution, Preston North End. Louis Moult replaces Tom Barkhuizen. Attempt saved. Rúben Neves (Wolverhampton Wanderers) right footed shot from outside the box is saved in the bottom right corner. Assisted by Diogo Jota. Corner, Wolverhampton Wanderers. Conceded by Declan Rudd. Attempt saved. Benik Afobe (Wolverhampton Wanderers) right footed shot from the right side of the box is saved in the centre of the goal. Assisted by Matt Doherty with a through ball. Substitution, Wolverhampton Wanderers. Romain Saiss replaces Hélder Costa. Offside, Wolverhampton Wanderers. Barry Douglas tries a through ball, but Benik Afobe is caught offside. Darnell Fisher (Preston North End) wins a free kick in the defensive half. Substitution, Preston North End. Daryl Horgan replaces Callum Robinson. Attempt blocked. Diogo Jota (Wolverhampton Wanderers) right footed shot from the left side of the box is blocked. Corner, Wolverhampton Wanderers. Conceded by Paul Huntington. Attempt missed. Rúben Neves (Wolverhampton Wanderers) right footed shot from outside the box is high and wide to the left. Delay in match Daniel Johnson (Preston North End) because of an injury. Substitution, Wolverhampton Wanderers. Benik Afobe replaces Alfred N'Diaye. Goal! Preston North End 1, Wolverhampton Wanderers 1. Hélder Costa (Wolverhampton Wanderers) right footed shot from the centre of the box to the centre of the goal. Assisted by Ivan Cavaleiro. Tom Barkhuizen (Preston North End) is shown the yellow card. Second yellow card to John Welsh (Preston North End) for a bad foul. Ivan Cavaleiro (Wolverhampton Wanderers) wins a free kick in the defensive half. Foul by John Welsh (Preston North End). Foul by Daniel Johnson (Preston North End). Ben Davies (Preston North End) wins a free kick in the defensive half. Corner, Wolverhampton Wanderers. Conceded by Joshua Earl. Hélder Costa (Wolverhampton Wanderers) wins a free kick on the right wing. Foul by Joshua Earl (Preston North End). Goal! Preston North End 1, Wolverhampton Wanderers 0. Alan Browne (Preston North End) header from the right side of the six yard box to the top right corner. Assisted by Callum Robinson with a cross following a corner. Corner, Preston North End. Conceded by Willy Boly. Attempt blocked. Darnell Fisher (Preston North End) right footed shot from the right side of the box is blocked. Assisted by Billy Bodin. Foul by Alfred N'Diaye (Wolverhampton Wanderers). Alan Browne (Preston North End) wins a free kick in the defensive half. Attempt saved. Alan Browne (Preston North End) right footed shot from the right side of the box is saved in the top left corner. Assisted by Darnell Fisher. Foul by Hélder Costa (Wolverhampton Wanderers). Daniel Johnson (Preston North End) wins a free kick on the left wing.